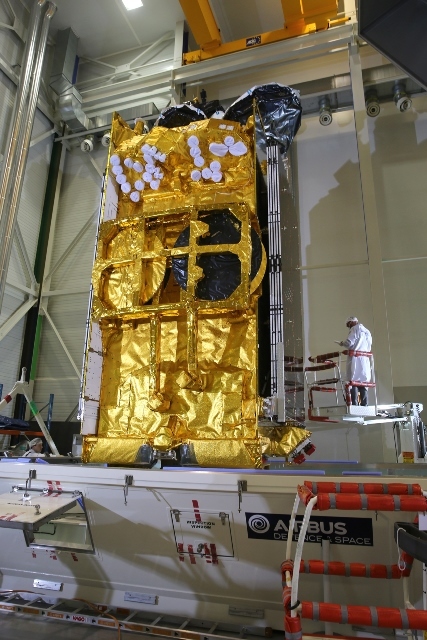 SKY Brasil-1, a telecommunications satellite made by Airbus Defence and Space for AT&T/DIRECTV, was successfully launched from the space centre at Kourou, French Guiana, on an Ariane 5 rocket. It was the 77th consecutive successful flight for Europe’s satellite launch vehicle. SKY Brasil-1 is the 44th Eurostar E3000-based spacecraft built by Airbus Defence and Space and the second for DIRECTV. With a mass at launch of 6000 kg and spacecraft power of 16 kW, SKY Brasil-1 has two deployable solar array wings and a number of deployable and non-deployable antennas. The spacecraft is 7.5m high and has a wing span 45m when the two solar array wings are deployed in orbit. SKY Brasil-1 has a double propulsion system: chemical for initial orbit raising and electric for keeping in station. It has been designed with a nominal lifetime of 15 years, and carries enough fuel for more than 20 years of in-orbit maneuvering.